The Hottentot is native to Southern and Eastern Africa and is diminutive, males and females have very similar plumage and bright blue bills. They are relatively common in the wild and are also well represented in captivity. Despite their small size they are very hardy and thrive on standard waterfowl diets but do also appreciate the addition of some foreign finch or millet seeds but this is by no means essential. While surprisingly hardy the small size of Hottentots can make them easy prey to vermin. Their small size makes them an ideal aviary species and they could easily be kept with other aviary inhabitants such as finches or doves. Hottentots can breed at less than a year of age and while they are more productive during the spring and summer they can breed at any time during the year. If maintained in an aviary they are perfectly capable of hatching and raising their own young and the male while not taking any part in the incubation process is certainly involved in the rearing of the young. A pair of Hottentot with their brood of diminutive ducklings is a delightful sight. Hottentots do not lay large clutches, a clutch can consist of between four and eight pale pink / brown eggs and six or seven is the norm with incubation at about 24 days. For a small duck the eggs are quite surprisingly large. Hatching is not normally difficult and a high success rate can be expected using any form of incubation. [If suitable vegetation is available Hottentots will make a natural nest but they will readily use nest boxes either on the ground or raised. 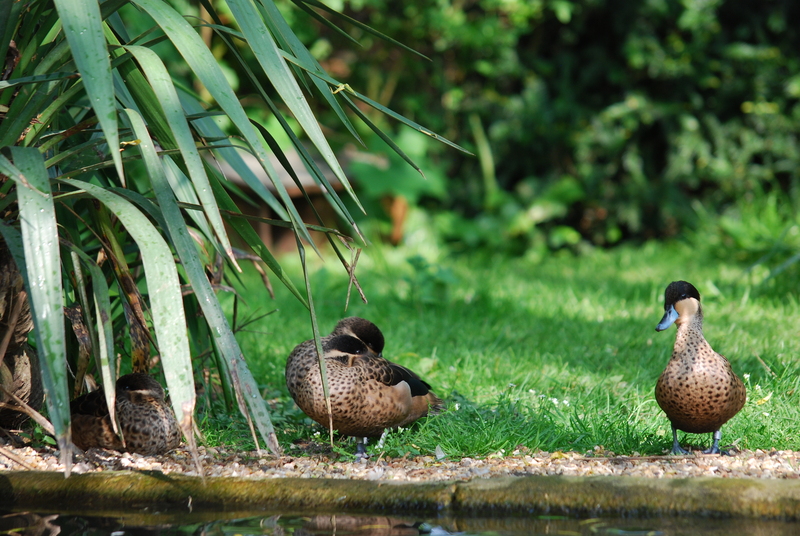 If the adults are left to rear their own young they will find a suitably sheltered site, usually in undergrowth near the pond and will take the young to the site every evening until the young are quite well grown. While Hottentots are not brightly coloured they are very dynamic and are always doing something interesting. The display consists of the head being held high with lots of head turning and a tok tok tok call regularly repeated and then followed by much rushing around the enclosure in a very hyper active excitable manner that is most amusing to watch. The male certainly accompanies the female during nest site selection and will often also enter nest boxes or sit on top of the nest box while female inspects inside but once nest site selection has taken place it is then unusual to see the male anywhere near the nest. Approx. 36 hour old Hottentot ducklings. In an aviary Hottentots make good parents and the male takes a reasonably active part in the rearing process. Until the ducklings are about 2 weeks old the female will take the ducklings off the water at night. This is a very poor quality picture but it shows the brood emerging from their roost / overnight shelter. In this instance the duck managed to get her brood into the shelter of a young sedge that had wire round it to precude ducks but somehow the duck would gather all her brood in this site every night.